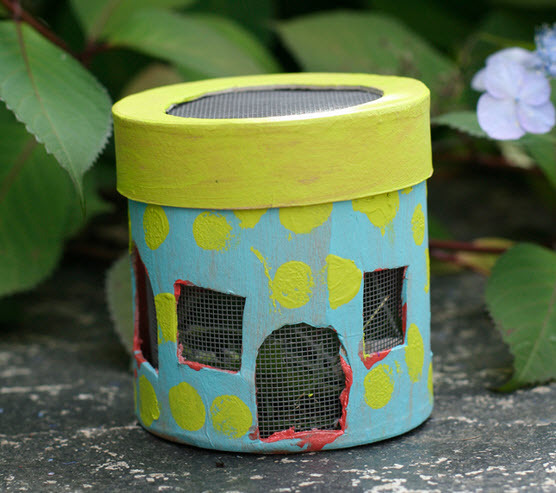 Recycle a paper food jar into a house for a bug! Get an empty oatmeal container or other paper jar. Cut out windows and a door from the sides of the container and cut out a large hole from the center of the lid. Paint and decorate the outside of the house. Cut pieces of window screen to cover the inside of the house and the lid, and glue the screens in place with hot glue. Furnish the house with leaves, sticks, or rocks that your bugs may enjoy, put a bug in the house, then release the bug after observing it.